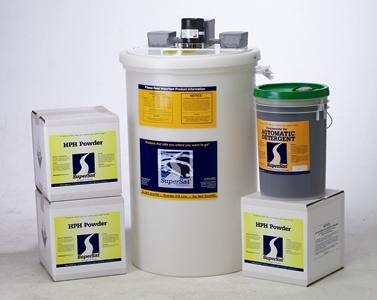 SuperSat detergents are 100% active, and by using water on-site, the costs are as much as 60% below other detergents. We will come out to your car, truck, or bus wash and install the above Super Sat detergent system for FREE! You can then use Super Sat for two weeks and decide if you like the system or not. If you don't want to use the Super Sat System, you pay for NOTHING. If you do like the Super Sat System, you simply pay for the detergent you have already used and then pay as you go from there. You will not be charged for the Super Sat tank or accessories! Further, since the patented Super SatSystem will remain ours, we will maintain the Super Sat system at our expense. You simply pay for the detergent you use (at better than 30% less cost than what you are currently paying for detergent), and you will get the exact detergent you want for your business! There are more than 6,600 Super Sat Detergent Systems currently in use throughout the United States. So you would be getting a system that has been tested, debugged, and worked through to perfection. For a complete understanding of the entire Super Sat Detergent System, take The Super Sat Tour, below. Blendco's patented Super Sat Custom Detergent System is an ingenious two-component detergent process that delivers powerful cleaning performance. The SuperSat unit automatically mixes our specially formulated detergents on-site using your water. The Super Sat system allows detergents to be tailored specifically to suit the needs of your wash.
Super Sat is a detergent process like no other, because it can deliver 100% active ingredients without the need for fillers, binders, or water to keep often incompatible detergent ingredients in solution. By using a powdered alkaline component and a liquid surfactant component, and by keeping them separate until they are automatically mixed with water at the wash, SuperSat is able to offer outstanding cleaning power safely and economically. Take the Super Sat Tour!! 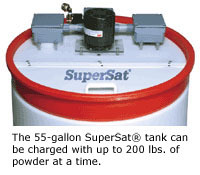 The patented Super Sat® tank provides a continuous supply of alkaline builder solution, using the cheapest thing on your property -- your water. The solution is the builder source for all your detergent needs: Tire Cleaner, Presoak, High Pressure Wash, Foaming Detergents, and more.As the solution is used, the water supply is replenished automatically and new powder is brought into solution automatically.Absolutely no measuring is required -- extra powder in the tank creates a long-lasting reserve that is used as needed by the system. Our Tire Cleaner has powerful solvents to attack brake dust. Our Presoak is formulated to break the bonds between road film and the vehicle surface. And our Foaming Detergents provide the "suds and show" your customers love to see. Here's where it all comes together: either in your soap tank, or directly injected into the washing process. The dual eductor valve combines the alkaline builder solution with the surfactant in the proper ratio and dilutions to make a great detergent. The dual valve contains removable orifice tips so you can customize either the alkali or the surfactant levels to suit your needs. Or adjust them both -- you're in control.